Succinct. Genuine. Direct. 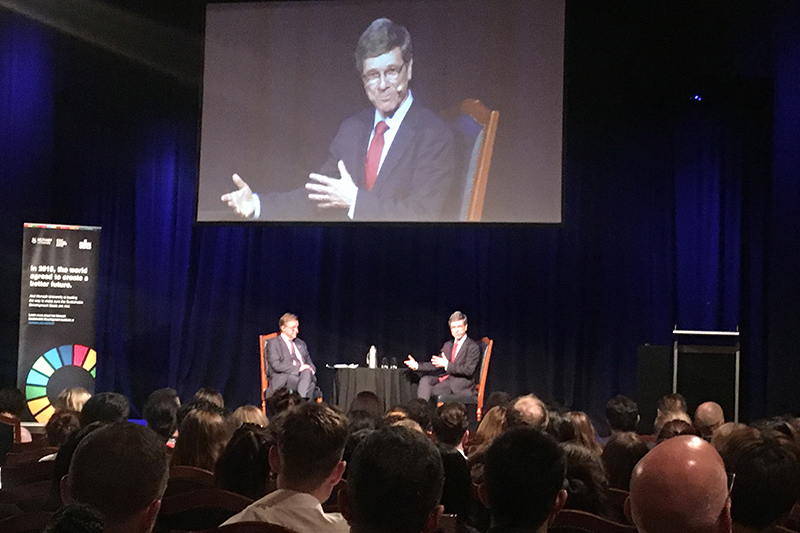 World-renowned economist Jeffrey Sachs is a master communicator and I was delighted to attend his lecture on A New Age of Sustainable Development at the Plaza Ballroom in Melbourne on 15 October 2018. His call for global partnerships and systems transformation is one we’ve heard before but nevertheless, his scathingly honest and unapologetic delivery held the attention of the 1000-strong audience, including mine. His message was clear: we’re on the brink of irreparable change to our planet and don’t have time for political games. Step 6: Measure, evaluate, and update plans. Technology with a human face (and control). And finally, his message to Canberra in the wake of the political reaction to the IPCC report on the impacts of global warming was blunt: Dismissing the work of international climate scientists is not big and it’s not clever. Be brave and start making policy in the interests of the whole country and the next generation. Gillian uses her communications and engagement talents with master’s-level sustainability knowledge to help businesses change for the better. With a flair for strategic thinking and passion for the environment, she has honed her skills during an extensive career in the government water and waste sectors.